Fall Gold is a large, conical, non-crumbling, very sweet, somewhat soft, golden berry. It is excellent for processing and fresh eating. Canes are vigorous, productive, and adaptable to a wide variety of soils. Not recommended for extreme northern areas. First crop ripens in July. Second crop from late August until frost. Zones 4 - 8. Hardy to -25 degrees F .
Planting Instructions: Fall Gold can be planted in almost any sort of well-drained soil. Start by digging a large hole big enough to encompass all of the roots of the plant without bending or circling. Raspberries should be planted in the spring. They are usually spaced 2-3 feet in the row with 8-10 feet between the rows. Plant raspberries about one inch deeper than the plant grew in the nursery. The plant, as purchased from the nursery, may be cut back to a few inches as most of the growth will arise from the roots or from the base of the planted cane. Any white sprouts arising from the crown should be covered with soil to prevent burning by the sun. 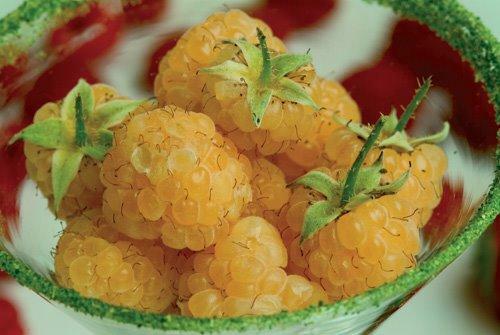 This listing is for 20 seeds of British Columbia Fall Gold Raspberry Plant.